Back in the days before the Interstate Highway system, old US 91 was unquestionably one of the great drives in Montana. Between Butte and Great Falls, the route crossed the Continental Divide and wandered through a series of lovely mountain canyons, evocative of the best of Montana. One of the narrowest and most spectacular stretches of road was along Prickly Pear Creek, north of Helena. Prickly Pear Canyon was narrow and steep-walled and scenic, with barely enough room for the creek, the road, and the tracks of the Great Northern Railway. 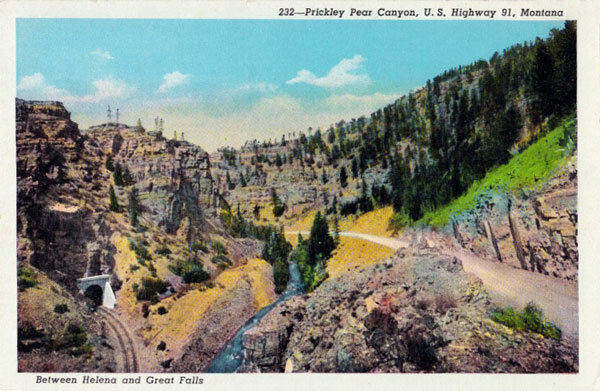 Today's photo is an old postcard view of the canyon, probably shot in the 1920s or early 1930s. (The road through the canyon was paved in 1931.) The photo has been retouched a bit and heavily hand-colored, but it's a great view of a scenic spot and a vanished age of travel.